John the Baptist reproached Herod for his marriage to his sister-in-law Herodias, whose husband, Philip, was still living. He thus earned the hatred of Herodias and was thrown into prison. At the King’s birthday feast Salome, the daughter of Herodias by her first husband Philip, so pleased Herod by her dancing that he promised to give her anything she wished. At her mother’s prompting she asked for the head of the Baptist. In the painting above, the executioner with a two-handed blow severs the head of John as he leans out of his prison. Perhaps this posture of St. John was infuenced by early miracle plays, in which a stuffed torso was thrust out of an aperture and the false head struck off. Salome stands waiting, her veil clasped by a high diadem and her skirt lined with royal ermine. Often she has a bowl, but here she holds a platter of impressive size with a wide, flat edge. She has gathered up her skirt and sways gracefully away from the gruesome sight. 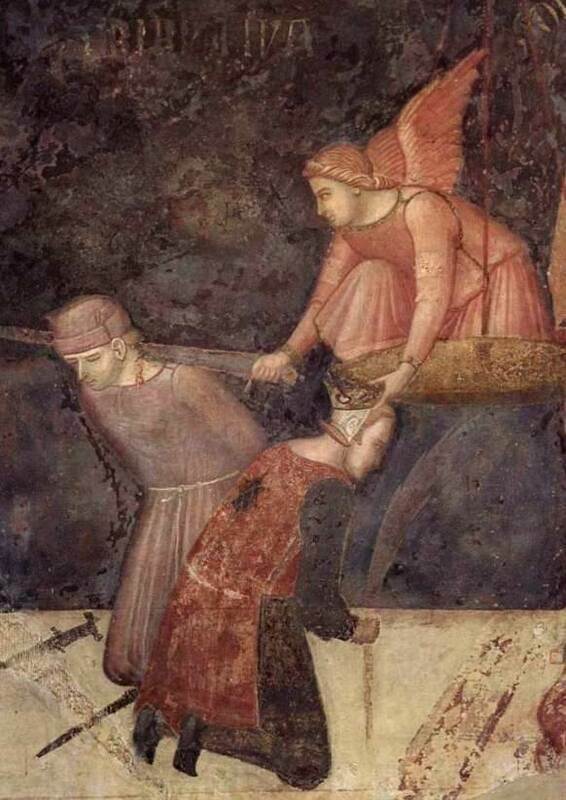 The execution is watched by an official and two companions, one of whom puts a hand on his shoulder and looks curiously at the scene – something like a scene of execution in Ambrogio Lorenzetti’s fresco in S. Francesco, Siena, whose theme was good and bad government. The official wears a high fur Busby. He holds a very large, twisted candle as a reminder that fire and light (and later fireworks) are associated with midsummer night, the birthday of John, who came to bear witness ”to the true Light” (John 12.9). Smoke rises from the chimney of the banqueting hall, where Herod and his guests await the return of Salome with John’s head.